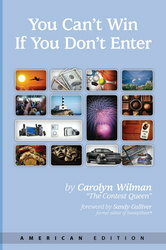 Imagination Edge Inc. announces the publication of ''You Can't Win If You Don't Enter,'' the American Edition, by Carolyn Wilman. Have you ever read about the people who enter Internet sweepstakes and win cash, prizes and unparalleled life experiences? Have you ever wondered, "Are these people for real?" Not only are they for real, but one of them, the Contest Queen herself, has written a book that reveals how these sweepstakes and contests can be won. A three-trips-in-one-week winning streak prompted her to write this book -- and using the techniques she outlines in her book -- Carolyn Wilman averages 5-15+ contest wins per month. While there have been many books in the past written on sweeping and contesting, Carolyn's guide is the first and only publication to focus specifically on the exciting world of Internet sweepstakes. Not only is Carolyn a seasoned sweeper, but she has also a promotional marketing expert giving her the unique perspective, having ''sat on both sides of the table''. In ''You Can't Win If You Don't Enter,'' Carolyn Wilman gives away all of her secrets. She reveals inside tricks, tips and approaches, from the etiquette of playing the game to the tools of the trade; from rules and regulations ... to the biggest mystery of all: how to increase one's chances of being a winner. Her book is truly instrumental in helping people learn to have fun and attract the luck needed to win big. For more information or for a free review copy, please contact the author at 1.866.231.6676 or at carolyn [at] contestqueen [dot] com. Books are available to order at BookSurge.com, Amazon.com, Alibris.com and Abebooks.com.